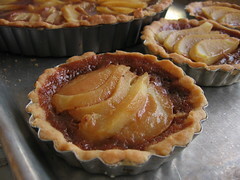 Caramel-Pear Tart with a Graham Shortbread Crust - Do You Know The Muffin Man? Notes: The Bartlett pears I bought from the supermarket were pretty green, but I thought poaching them in the white wine, orange peel, cinnamon and ginger mixture would soften them up. This assumption was incorrect, they stayed somewhat crunchy, even after baking. I didn't want to buy another liqueur, so I substituted Apfelkorn for pear brandy. Also, I used graham crumbs instead of graham flour. The tart dough has a lot of butter and is very, very tender. The original calls for a 10" tart pan; I used a 9" pan plus four smaller tart pans. The caramel mixture is delicious and the only way to improve this tart would have been to use riper fruit.